Soba noodles are made from buckweat flour and are part of Japan`s traditional cousine (washoku). 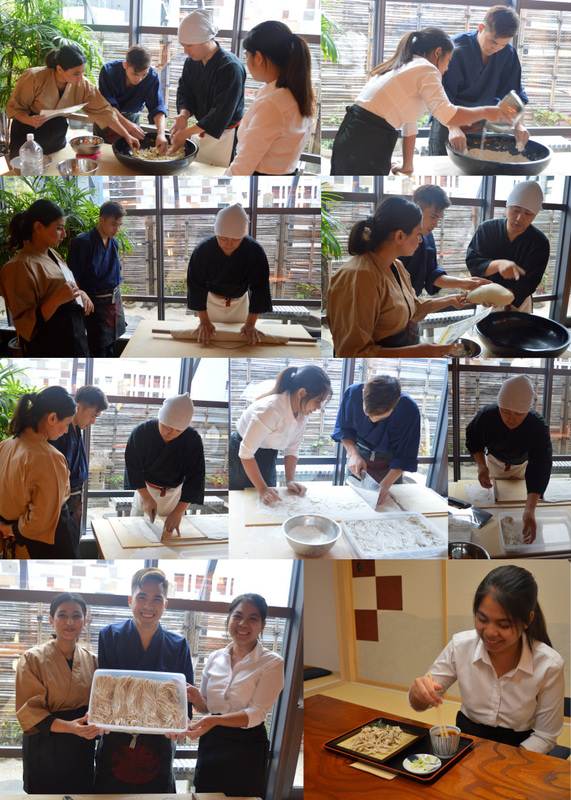 Listen the explanation of soba noodles making. Mix water and buckwheat flour together. The easiest and fastest way is to use your fingers. Keep kneading the texture so water will spread evenly. In case lumps appear, repeat kneading of the texture until the lumps will gradually disappear and the texture becomes smooth. Sprinkle a little bit of the flour and put the dough on it. Make the texture thin using your hands until you will shape a big flat square. Use the rolling pin to make the dough even thinner and even. Sprinkle a little bit of flour on the thin dough. Using the knife cut the soba noodles thinly. Boil the soba noodles. After soba is done, you can take it out or you can enjoy your meal at WJS Ginza. Those who decided to eat soba noodles in, choose the flavour for your soba noodles and WJS Ginza staff will serve them. Enjoy your soba noodles. After your meal we will serve Japanese green tea. ※The equipment charge used on the day is also included in the above charge. Soba noodles are popular everyday meal in Japan. They have been eaten since Edo period. During Edo period, soba noodles was eaten at the end of each month. It was regarded as special meal, celebrating good health..
Nowadays, the most popular tradition is to eat soba on New Year`s Eve for longevity and prosperity, or another popular custom is to eat soba after moving to a new house.